We are happy to announce a new feature that allows you to make corrections and other copy editing changes to member content. This has been a huge ask from many Network Creators; to effectively manage your Ning Network, you need the ability to make copy edits and corrections to content your members create. Making such changes has been a very tedious process in the past. Your only options were to either contact and ask your member to edit the content (potentially a time consuming process) or delete the content (too strict in most cases). We’ve made this easier with a new feature launch. You can now conveniently make appropriate edits to the content created by members on your network, including: Photos, Videos, Events, Blog posts and Forum discussions. You also have the ability to edit comments that members make to forum discussions. When you visit a member content page now, you will see the option to Edit it, just like you see today when you create your own content. When you click to edit, you’ll see the content edit page where you can make the appropriate changes and save them. 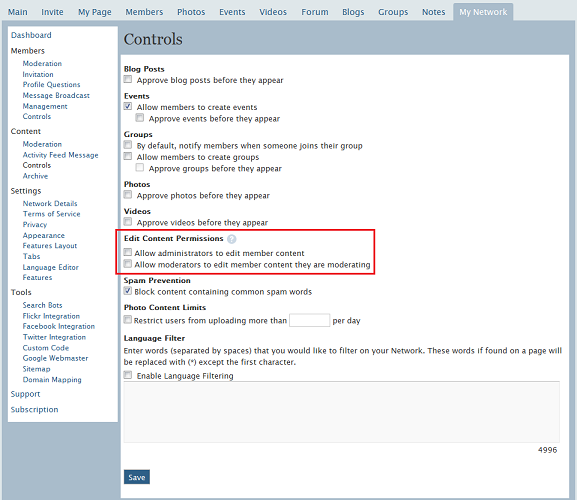 These options enable administrators or moderators to edit member content respectively. Please note that you have to explicitly enable these settings since they are not on by default. We hope you find this feature useful in managing your Network more effectively. Please stay tuned as we push out even more changes to give you better control over your Network and your content. I would like to edit photos that I have previously uploaded to my site. Online forums indicate that this is easy to do. When I attempt to follow these instructions I discover that ‘Options’ and ‘Links’ are referred to that do not appear on my screen. Are these features only available to premium subscribers? Our administrator, Judith Whitelaw, is away for awhile. She told me she has given me administration rights but I canot see how this benefits me. However, my biggest concern is that I have quite a few members wishing to join our group and I cannot locate any ‘Invite’ tabs to invite them. It is crucial they are members before the 24th September because I start a course and they will require access to the Forum to put their questions. Hoping you can get back to me ASAP. Many thanks, Robin Lings. Robin: You might want to share your question on the Creators Ning Network. We also have a Help Center that has a lot of informative articles about this, but we’re not always able to respond to help requests in blog comments. I appreciate that this is a nice feature for some, but for me, it’s cumbersome, and I find that I’m constantly accidentally clicking into one of my user’s forum posts and activating the post editor. Is there a way to turn this feature off for the Ning Creator? Thanks! Finally! I’ve been waiting for this feature for so long, thank you! Now please give us the ability to create re-occurring events. I will soon be a community administrator on ning, but I need to know how to prevent my members from adding contents to the blog. Hi, Chiara. You can simply set it so you must approve all blog posts before they are public. You might want to join the Creators Ning Network or read up on how your network works in the Help Center. It has a lot of informative articles about exactly these kinds of features. Good luck! We are considering getting a plan for our network but before we do we need to be able to talk to your live customer service representative if you have any as we have some questions we’d like to clarify. Please give us more time as we are trying to get all the consensus from our members. You may communicate with me through my email: julius.robles@gmail.com so i can reply immediately. Also, I would like to state that my eMail address isn’t functioning as well. I can’t seem to get my mails and still have to use YAHOO.COM as an email address for my Company’s eMail Address.., HELP!!!!!! Hi, Stephen. You might want to submit a ticket in the Help Center if you are having specific problems about signing in or receiving emails. When can vi change members nick on the sites?. Sometimes we get new members who have nicknames that is not so good to have. Hi, soh. We generally try to respect members’ identities, but I sometimes run into this problem myself. I usually kindly ask them to change it. You might also make it part of your community guidelines. Hope this helps! I’ve noticed though we can only reset the members image. I’d like the ability to set a different generic image for each user who refuses to upload a profile image. We do this on our local community/news website and it encourages users to upload their own cool image once they see an ugly generic image is their profile image. Then it encourages even more signups and participation at the site when all the users have different profile images. I am shocked: a spammer can flood my ning with sexual ads and I can’t block him because I chose to close my ning. Please close immediately the ning or let me know how I can block the spammer. Hi, Domenico! You can always simply take your network offline. I’ve done this for you. Thanks for your contact me for your plan and pricing on my website. Currently we do not have money for paying it and also i invested in farming until December or January 2011. Therefore, i kindly requested you to allow me to continue to accessing website until the time I will get the money and pay the site. Also in kenya do not use paypal or credit cards it is good to create or send us your bank details in order if we have money we pay either the check or pay transfer money. All administrators to help mu suggestion and help me for while. Thanks very much for your work offer and willing to support all effort. Hi, Johnstone! We can sometimes accept alternate billing info, and you can do that by submitting a Help Center ticket.